Stocks continue to grind higher in a slow and bumpy recovery from their first quarter selloff. By the end of July, U.S. stocks had retraced most of the declines from their January highs and were solidly positive for the year. A big driver of this rebound has been solid economic growth and even more spectacular earnings growth. It is widely acknowledged that fiscal stimulus from tax cuts has probably given the U.S. economy a new lease on life. A remarkably prolonged economic cycle, which is now in its 10th year, seems poised to not only extend its longevity but also to accelerate in the near term. U.S. GDP growth of 4% in the second quarter is a significant uptick from levels seen in recent years. Earnings growth of over 20% in 2018 has also exceeded already high expectations. The strong growth narrative is one of the biggest tailwinds for the stock market. While growth rates will inevitably moderate in coming months, we believe they will remain solid enough to extend the cycle into the next couple of years. The pickup in growth has also been accompanied by a gradual rise in inflation. But the good news is that inflation and, therefore, interest rates still remain contained. We see this combination of growth and inflation as being “not too hot, not too cold”. We borrow this famous description of Goldilocks’ anecdotal porridge to define the U.S. economy in the near term. A number of challenges have emerged over the course of the year to confront this Goldilocks economy. One of the most prominent headwinds has been the escalation of trade tensions from the continuous announcement of tariffs. The natural consequence of an extrapolation of this trend is a full-blown global trade war. Fears of such an outcome have induced a lot of market volatility and kept a lid on stock market gains. We analyze how the tug-of-war between the Goldilocks economy on one hand and trade and tariffs, on the other hand, is likely to play out. In the foreseeable future, we believe that Goldilocks will trump tariffs! We first examine the “not too hot” premise of the U.S. economy. We look for signs of overheating and find them notably inconspicuous on the inflation and interest rate fronts. Even with recent signs of an uptick, it is remarkable how low inflation is running, especially at this late stage of the cycle and at these low levels of unemployment. The breakdown of the inverse relationship between inflation and unemployment has been one of the more puzzling aspects of this economic cycle. It has taken almost a decade of monetary stimulus for core inflation to climb back over 2%. Over that same time period, the unemployment rate has come down dramatically from almost 10% to below 4%. 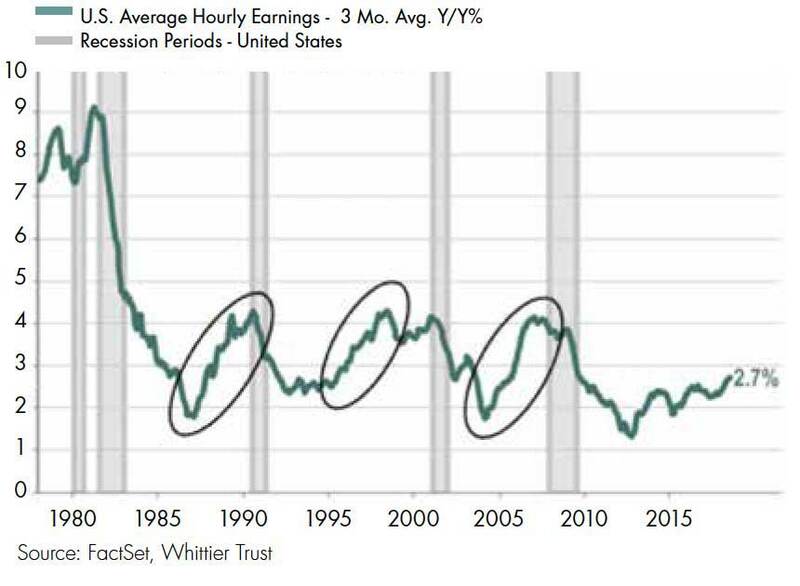 Wage growth is one of the key drivers of inflation in the U.S. As we can see in Figure 1 above, the pace of wage increases has been especially muted in this recovery. In the past, average hourly earnings (AHEs) have risen from a 2% pace to 4% in a period of 3 to 4 years during an economic recovery. In this cycle, wages began to inch up from a 2% growth rate most recently in 2013. Five years later, wage growth is still just 2.7%! At this rate, AHEs will not hit the 4% pace typically associated with the next recession for several more years. Inflation and interest rates generally move in tandem. Coincident with muted inflation, interest rates are still relatively low despite the Fed’s tightening policy. The Fed funds rate is below the rate of core inflation. And with 2nd quarter nominal GDP growth of above 6%, it is outright astonishing that the 10-year bond yield is still below 3%! There has been considerable angst among investors that the fiscal stimulus is likely to be short-lived. The bearish narrative on growth runs as follows. The impact on growth from tax cuts is simply a “sugar high”. As extended as the cycle has been, we have now accelerated any remaining growth and thus brought the end of the cycle even closer. And for good measure, the downturn will be even more severe because we have created larger fiscal deficits from the tax cuts just as rates are beginning to rise. These fears may be exaggerated as we offer the following “not too cold” perspective. We believe that the effect of tax cuts will last beyond 2018. Our view draws upon research from the Congressional Budget Office (CBO) which actually forecasts that the fiscal stimulus could boost U.S. economic growth for almost a decade (Figure 2). The key findings from the CBO research study are listed below. The stimulus from the 2017 Tax Reform is not projected to fade away in a year or two and is instead expected to last an entire decade. The impact from the tax cuts is actually the lowest in 2018. Its influence grows in subsequent years and is the greatest in the middle years of 2021 to 2025. The rising benefits of tax cuts over the next several years can be traced to greater incentives to invest and work. The benefits of tax cuts begin to fade away beyond 2025 as the sunset of individual tax cuts and higher interest rates from bigger deficits detract from growth. 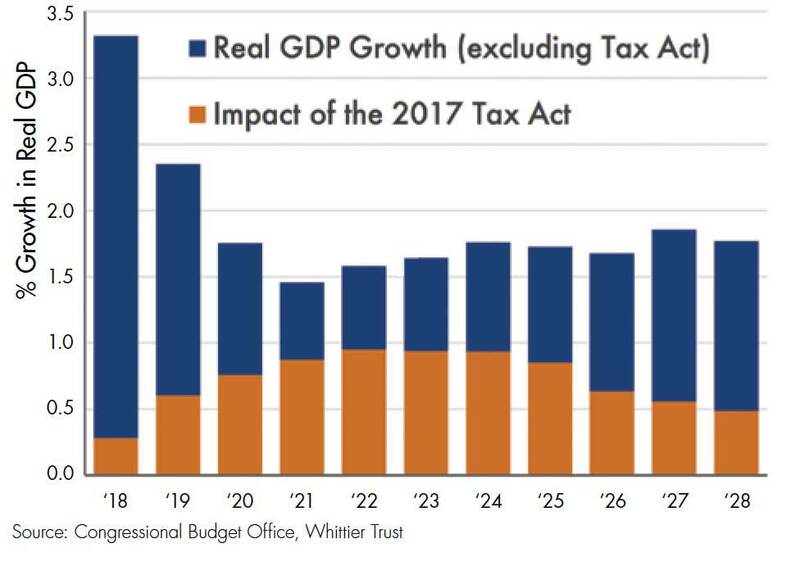 The impact of tax cuts on annual growth ranges from a low of 0.3% in 2018 to a high of almost 1% in 2022 and averages about 0.7% over the next decade. By the same token, a lot has been written about how the bull market in stocks is at risk because earnings growth for the S&P 500 will peak in 2018. We hope to allay those concerns through two observations. Even though earnings growth will peak in 2018 at around 20%, earnings will still continue to rise higher in 2019 and 2020. The consensus forecast for earnings growth in 2019 and 2020 is about 10% in each year. We believe that there may even be some upside to earnings beyond 2018, based on the observations above for future economic growth. In the past, the stock market has continued to rally even after the peak in earnings growth rates. While lower than 2018, we expect that both economic and earnings growth will remain healthy in the near term. The rhetoric and action on trade and tariffs has escalated in recent weeks. At the time of this writing, the latest escalation came in the form of even higher tariffs of 25% on $200 billion of Chinese imports. This announcement follows already proposed tariffs against China and our allies. We acknowledge that cross-border trade is increasingly important to the global economy. 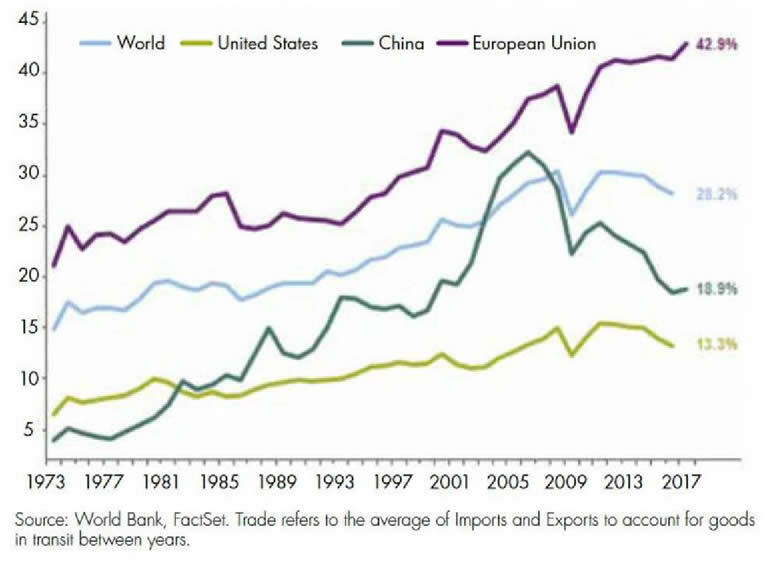 Figure 3 shows us just how important trade is for each of the world’s major economies. The U.S. economy is significantly more dependent on domestic consumption than it is on net trade. It, therefore, comes as no surprise that the U.S. relies a lot less on global trade than does the European Union. We also acknowledge that the actual implementation of the most Draconian version of the announced tariffs would have a meaningfully adverse effect on the U.S. economy. 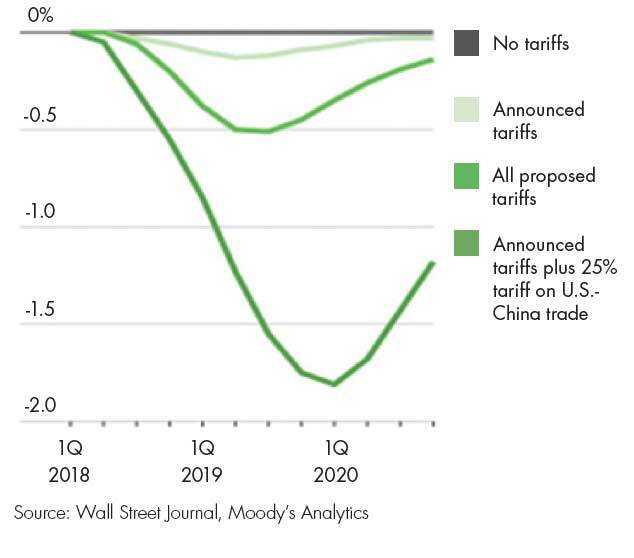 Figure 4 (next page) estimates that the combination of announced tariffs as of July 2018 and a 25% tariff on U.S.-China trade could slow the U.S. economy down by between 1 to 2% in the next couple of years. Even as we reflect on the ramifications of a trade war for U.S. growth, we summarize our views on trade and tariffs. While we make note of these projections, we do not believe that a full-blown trade war will actually materialize. We believe that the threat of tariffs is a negotiating tactic and that a resolution will eventually be found before the progression of retaliations degenerates into a global trade war. Our optimism is based on the simple premise that no one wins in a global trade war and that cooler heads will, therefore, prevail. We observe that U.S. stocks are not discounting a dire outcome on the trade front. Chinese stocks, on the other hand, have been hit hard with a decline of almost -20% in 2018 and may signal some urgency to policymakers in China to find a compromise. Corporate profits have soared and economic growth is poised to accelerate as a result of tax cuts and deregulation. We believe that market fundamentals are nicely balanced between healthy growth and muted inflation in an optimal “not too hot, not too cold” setting. The good news on the economic and earnings front has, however, been tainted by uncertainty related to its sustainability and the additional complications of geopolitical risks and trade tensions. Despite these concerns, we believe that the current bull market and the current economic cycle have a good chance of becoming the longest ever recorded in the U.S.
We remain vigilant to the risks and opportunities presented by this backdrop and conclude after a careful assessment that, at least for now, Goldilocks trumps tariffs! Investment and Wealth Management Services are provided by Whittier Trust Company and The Whittier Trust Company of Nevada, Inc. (referred to herein individually and collectively as “Whittier Trust”), state-chartered trust companies wholly owned by Whittier Holdings, Inc. (“WHI”), a closely held holding company. WHI may utilize the services of its subsidiary, Belridge Capital, LLC, a state registered investment advisor, to provide sub-advisory services for certain accounts and proprietary private fund investments. This paper is provided for informational purposes only. The views expressed by Whittier Trust’s Chief Investment Officer are as of a particular point in time and are subject to change without notice. The information and opinions presented herein have been obtained from, or are based on, sources believed by Whittier Trust to be reliable, but Whittier Trust makes no representation as to their accuracy or completeness. Actual events or results may differ materially from those reflected or contemplated herein. Although the information provided is carefully reviewed, Whittier Trust cannot be held responsible for any direct or incidental loss resulting from applying any of the information provided. Company references are provided for illustrative purposes only and should not be construed as investment advice or a recommendation to purchase, sell or hold any security. Past performance is no guarantee of future results and no investment strategy can guarantee profit or protection against losses. These materials may not be reproduced or distributed without Whittier Trust’s prior written consent.